Thread: Anyone going to MQX? I am going! I am not attending any classes just going for the show on Saturday. Look for the collaboration quilt I entered (I only did the quilting). Pictured here: https://www.quiltingboard.com/pictur...d-t302441.html It is in "our Daily Bed" category. MQX is great and they do a wonderful job. You will enjoy your classes, especially if you got into some hands on classes. Lots of beautiful quilts, great teachers, vendors and loads of fun. Enjoy! So far I'm planning on going for one day, Saturday, four hour trip one way, but I'm good for it....after all it is for quilting. Lol. Scoping it out for next year to hopefully attend for the entire show. Just got a midarm in January. 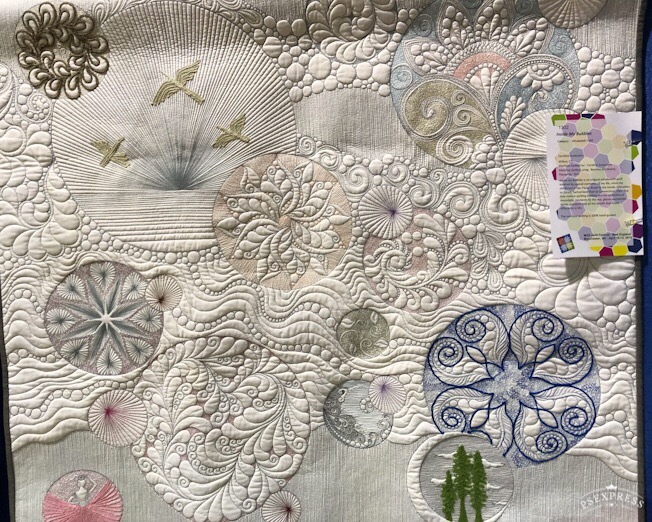 Feline, I look forward to seeing your work and the quilt up close and personal...I attended MQX a couple of years ago but did not have a longarm so I will be experiencing the show differently this time around. I agree that they do a wonderful job providing classes and great teachers. Maybe we’ll bump into each other on Saturday. I wish I lived closer! Can't make it this year, maybe next. Feline, I remember that quilt when you first posted it. The quilting is stunning! Have fun y'all and be prepared to give us a full report when you get back! Last edited by rryder; 04-06-2019 at 02:04 PM. That’s great Rob, I will definitely be anxious to see your work too. I’m always inspired by your art and creativity...I’ll try to post photos next weekend after the show. Feline, your quilt was even lovelier in person. Did you piece it or do the quilting? Rob, your work is awesome and truly art. I am amazed at how much you accomplish in your work. Jmoore, thanks for the kind words on mine. I was surprised to see they moved Peony Fantasy from the category I entered (Custom Our Daily Bed) to Custom Heirloom but I suspect they needed more quilts in that category which is why they moved mine to it. There were only 9 quilts in Custom Heirloom including Peony Fantasy. I only quilted it, it was pieced by someone else. 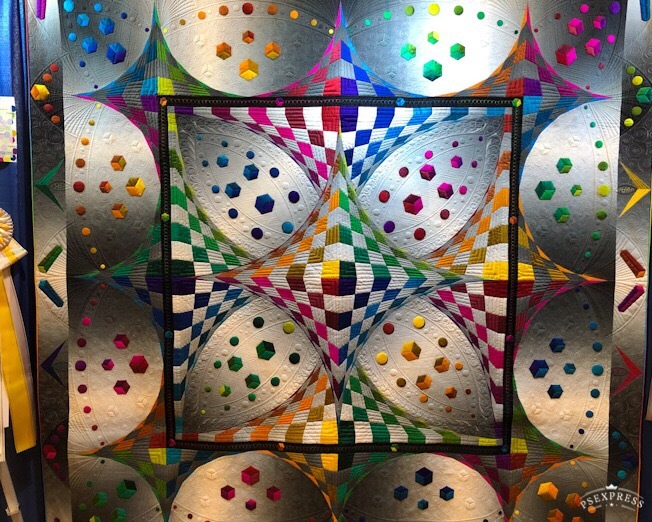 Rob, I saw your one art quilt that you have posted here before but I didn't see your other one. But I didn't look at every single label of every quilt. The one I did know was yours looked great and they had it displayed right on one of the coveted end of aisle spots. The show was fabulous, unfortunately most of my pics came out blurred. grrrr. 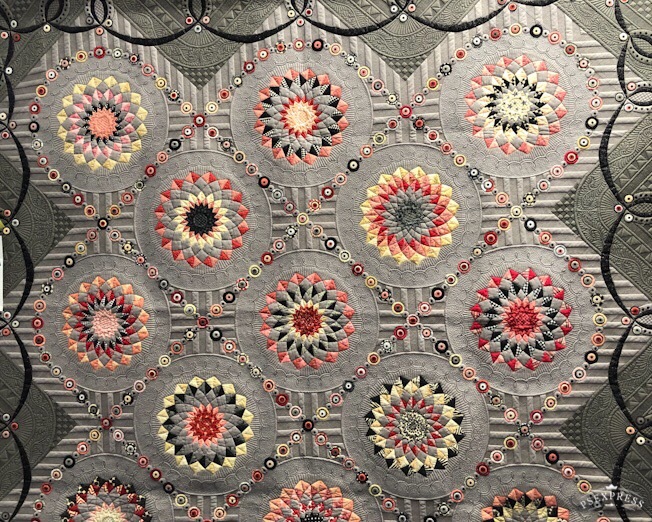 For additional info on the quilts Jmoore posted the first one with the rose and red dahlia type blocks on gray was made by Gail Stepanek and quilted by Jan Hutchison. They have been a team for quite a while now and always do amazing quilts. That one took 3rd in the custom heirloom category, so that should give you an idea of the level of quilts in this show. Jan is my quilting hero. She also quilts on an Innova and is a true artist with a longarm. These two ladies appear often in the winner's circle of national shows; as it should be because their quilts are just exquisite, unique and push the limits in applique, piecing and quilting. The one with the Bernese Mountain dogs was just amazing. The quilter (Kelly Freeman) incorporated some very unconventional embellishments like using wrapped wire (like is done in jewelry making) into the trees in the background. She also used roving in the front legs of the one dog sitting in the foreground. It totally worked and looked fabulous. I didn't even realize the wrapped wire was in the quilt until I read the card and specifically looked for it, the wire was that fine and that well done. The last quilt she pictured was Best of Show, Carnival pieced by Beth Nufer and quilted by Clem Buzick. 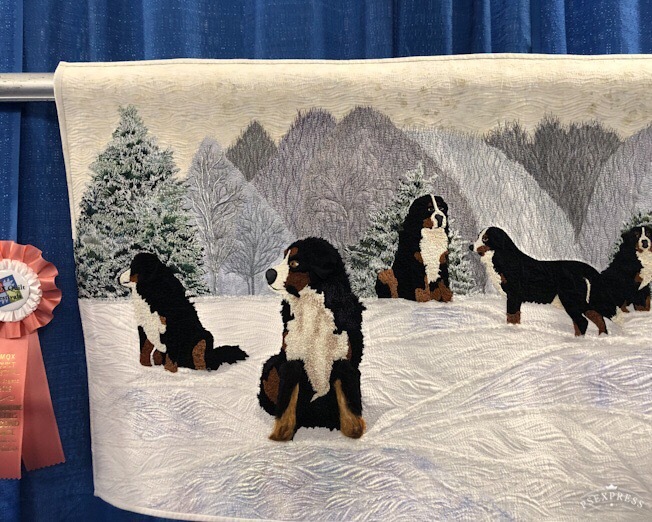 They are another team that have done extremely well over the years like Gail and Jan. Beth's use of ombres is just amazing and she does it on most of her show quilts that I have seen. Her piecing is equally mind blowing. Clem's quilting treatments are equally amazing and she has great talent for enhancing Beth's quilts. It was a wonderful show, I wish I had better pics to share. I will sort through them better tonight and see if I can post some pics. Jmoore, those quilts are amazing, thanks for posting pics and Feline thank for describing the details on these.